Hon. Sheikh Hasina, Prime Minister of Bangladesh, gives her inaugural address None other than the Prime Minister of the People’s Republic of Bangladesh, Her Excellency Sheikh Hasina, graced as Chief Guest, the most significant event in Bangladesh jointly organized by the Colombo Plan Staff College (CPSC) and the Institution of Diploma Engineers of Bangladesh (IDEB). 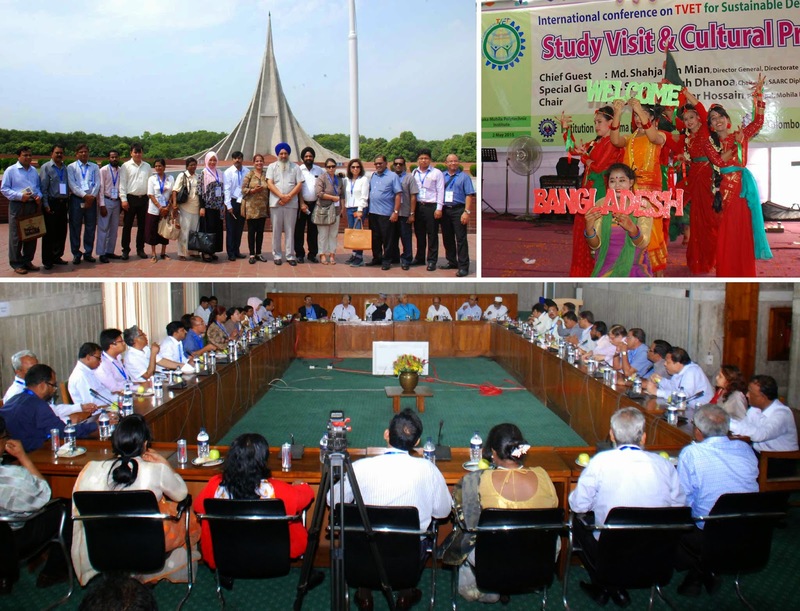 The International Conference on TVET for Sustainable Development (SD) held at IDEB in Dhaka, Bangladesh from April 30 to May 2, 2015 served as IDEB’s major launching program with CPSC as CPSC’s Honorary Member. IDEB was recently proclaimed Honorary Member by the CPSC Governing Board. 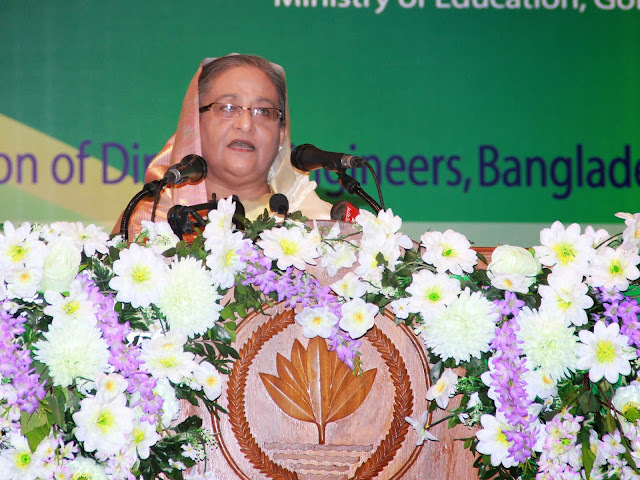 Clearly and fully demonstrating her commitment to the cause of Technical and Vocational Education and Training (TVET) geared towards sustainable development the Prime Minister inaugurated the international conference. In her inaugural address, she emphasized her advocacy in turning the country's huge manpower into the nation’s assets and address the country’s growing economic and social needs. This she hopes to be accomplished through expanding vocational education by establishing one technical school in each district (upazila) and extending its benefits to rural areas nationwide. She further said that “I encourage engineers of this country to partner with the government to fulfill its goal of becoming a middle income country by 2021 and in bringing lasting changes to the country's physical and human infrastructure”. A host of other key government officials were also present to express support on TVET for SD, which include Honorable Minister of Education, Mr. Nurul Islam Nahid, MP, as Special Guest. Officiating the event was the Steering Committee Chairman Mr. AKMA Hamid, President of IDEB. Other invitees included and the General Secretary of IDEB, Mr. Md. Shamsur Rahman, who also gave the welcome address. The CPSC Director General Dr. Mohammad Naim Yaakub, who acted as Co-Chairman of the Steering Committee cited in his opening address the need for the present generation to find probable and permanent solutions to uphold green practices in operations and the exploration of technological advantages to pursue that goal. He mentioned CPSC’s own initiatives to promote sustainability through the “Green CPSC Program” and wishes to be a conduit in strengthening the “south-south” cooperation through the promotion of sustainable practices in TVET. He shared that the organization “takes pride in keeping its role as a focal agency and catalyst “in bringing TVET issues to the table by sharing innovative practices, experiences and information among the regional and global TVET community. With the advent of globalization and the integration of economies, the role of TVET is undeniable in spearheading the economic growth and progress of both developed and developing countries through their respective human resources. In conjunction with the global advocacy to preserve the present for the benefit of the future, various initiatives have been explored and tackled to find a balance between advancement and sustainability. More than ever, TVET systems in the world have to be geared towards this effort through small but significant steps that explores cooperation and diplomacy among countries that share similar aspirations. Participants of the 2015 International Conference in Dhaka, Bangladesh (L) and Dr. Naim and Dr. G.K. with other officials and guests (R). Considered as one of the largest gatherings on TVET in Bangladesh, this event was attended 850 administrators and managers from the local and international TVET sector. In its part, CPSC ensured the attendance of 16 experts from the different CPSC member countries such as: Afghanistan, Bhutan, Fiji, India, Malaysia, Maldives, Mongolia, Myanmar, Nepal, Philippines and Thailand aside from the host, Bangladesh. These participants imparted their own experiences in promoting sustainable development in their own initiatives and through the organizations that they represent. Dr. G. Kulanthaivel, CPSC Faculty Consultant also involved in the conference as CPSC Coordinator and presented his paper. Themes addressed in the four-day program included green technologies in industry and institution, building skill culture for inclusive growth, entrepreneurship development, social and professional integration of TVET, TVET curriculum for Education for Sustainable Development (ESD), accreditation and cross mobility for TVET workers, research, monitoring and evaluation in TVET, reorienting TVET policy towards ESD, challenges and issues in polytechnic education, innovative approaches in technical teacher education, and other relevant themes related to sustainable development. Furthermore, representatives coming from other technical institutes in other parts of the globe such as Swinburne University in Australia, East West University in Bangladesh, Nanyang University in Singapore and other prestigious academic organizations were invited to share their expertise and insights. Representatives from the regional and local arm of the International Labor Organization (ILO) also participated in the event who shared their SD perspectives. The participants also visited some of the notable landmarks in Dhaka including the National Martyr’s monument, the Bangladesh National Assembly and the Mohila Polytechnic Institute as part of the cultural integration aspect of the program. Participants visit some of the places of interest in Dhaka (clockwise) such as the National Monument the Mohila Polytechnic College and the Parliament.